A collection of in-depth video tutorials. Built-in Help Assistant and free, quick tech support service. 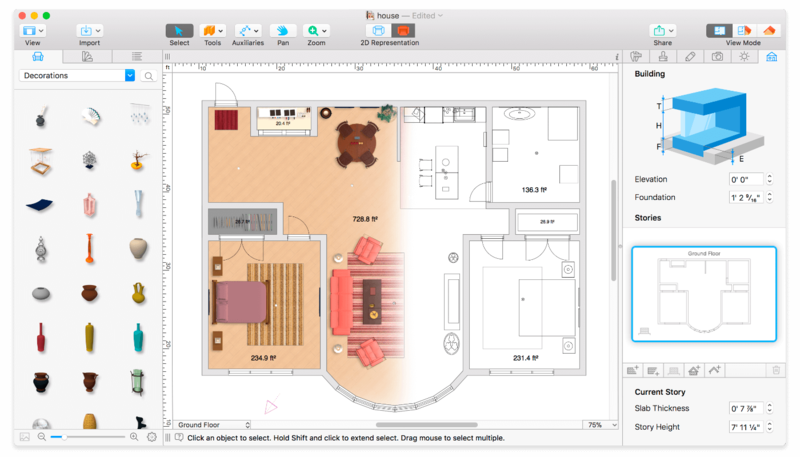 View real-time measurements for walls, ceilings, and floors when drawing in 2D Plan view. Precise positioning thanks to smart guides and object snapping. Adjust the lighting, add and move objects, apply materials, and more right in 3D. All changes, made in 3D or 2D, are rendered in 3D in real time. Walk through your 3D interior. Set multiple cameras to see the house from different point of views. Adjust light fixtures throughout your project to get realistic lighting scene. Create corner windows and complex openings using the program advanced technology. Level of details tool allows to optimize 3D object and speed up the project. Professional Shadow Map technique makes shadows look soft and natural. 2,000+ furniture and other models. Import models seamlessly from Trimble 3D Warehouse™ (previously Google 3D Warehouse™). 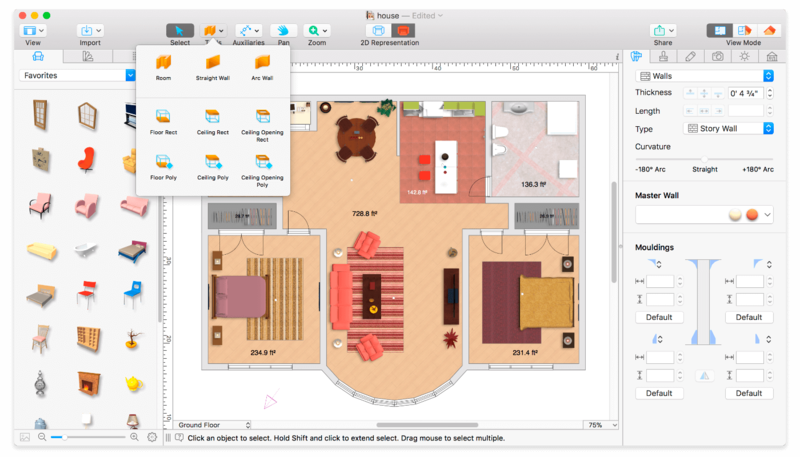 Drag and drop any image from the Finder to apply it to any surface as custom material. Set the exact size of a material tile to know how much of the material is needed for your house renovation project. 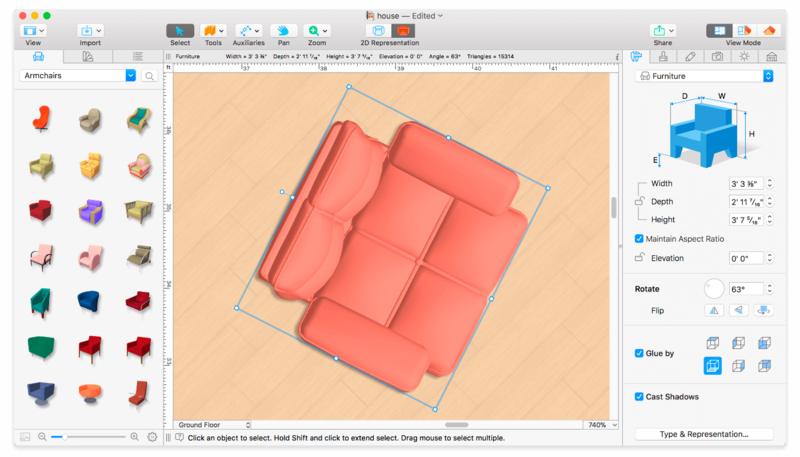 Import objects in SketchUp, COLLADA, KMZ, FBX, OBJ or 3DS formats by simply dragging and dropping them into your project. Roof Assistant with 12 customizable roof templates. Add custom segments to fully customize your roof. Share the result to Facebook, Twitter, Vimeo or YouTube. Export 3D views to JPEG, TIFF, PNG, and BMP (up to 16000 x 16000). Share 360° Panorama JPEG images (up to Ultra HD) to Facebook. Render a realistic video walkthrough (up to Ultra HD). Create Stereo 3D Video, 360° Video and even Stereo 3D 360° Video. Quickly send a copy of your project via Mail, Messages or AirDrop. Export the entire project or selected objects to COLLADA, Trimble SketchUp™, VRML Version 2.0 or X3D format. Note:In order to open projects created in version 3.5, make sure you updated the app to the latest version on all your devices (iOS, Mac and Windows).